The delivery of a complete Aircraft Fire Training simulator to Ashgabat in Turkmenistan. A client approached us to look into how best to transport a complete Aircraft Fire Simulator (based on a Boing 737 aircraft) from Ashbourne in Derbyshire to the newly rebuilt and refurbished Ashgabat International Airport in Turkmenistan. Due to time constraints speed of delivery was essential owing to the opening of the new airport. 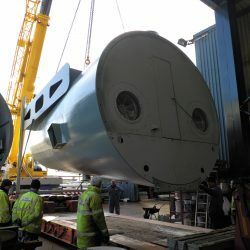 The SLS team worked closely with the manufacturer in the UK and stake holders and contractors in Ashgabat to provide a seamless door-to-door delivery of multiple, out of gauge break, bulk items and also smaller loads being shipped in containers. It was vital that all the items arrived in Ashgabat at the same time even though the shipping methods used would be different. The route via the Black Sea to Poti in Georgia, overland to Baku in Azerbaijan and from there by ferry to Turkmenbashi in Turkmenistan and then onwards by road to Ashgabat, was a very complex route to plan. Space on suitable vessels was obtained, road transport and permits were obtained in the UK and abroad, and partners in Turkmenbashi were engaged to inspect the cargo on arrival and to arrange for onward delivery to site so as to arrive in the required order. Consequently, the entire shipment arrived on time and in the correct order. The client was extremely happy with the service provided by SLS and commented that it was reassuring to be able to work with a company that “new it’s stuff”! The expertise of the SLS team in understanding the complexities of cross boarder deliveries even to the most challenging of destinations in the world is second to none, and we pride ourselves in never being beaten. We will always find a way of delivering a service that our customers demand and expect of a leading company such as SLS.